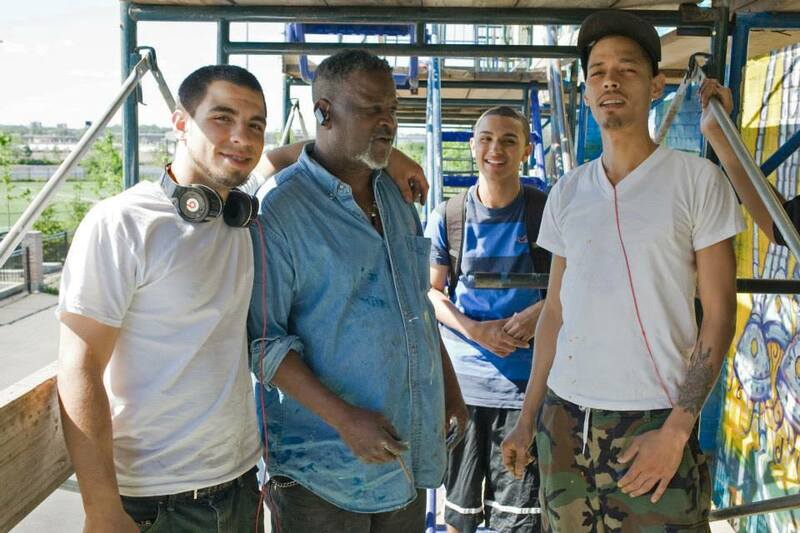 Newark Murals is proud to share a progress report on our first five years of work. Download here (PDF). Newark Murals projects feature prominently in these visuals from OTV and Bc2tone. We’re proud for our work to become embedded in our city’s culture. Hat tip to Jared Ash on BC2tone! Students shared the questions they had about water at the beginning of the investigation. The presentation began by challenging everyone to make a quick sketch of how they imagine water gets to Newark and where dirty water goes. The students’ poster on what they learned through the investigation. In attendance were City of Newark Acting Director Andrea Adebowale, The Trust for Public Land Newark Director Scott Dvorak, and members of the Newark Water Group Bill Chappell, Dan O’Flaherty, Lenny Thomas, and Brenda Toyloy. 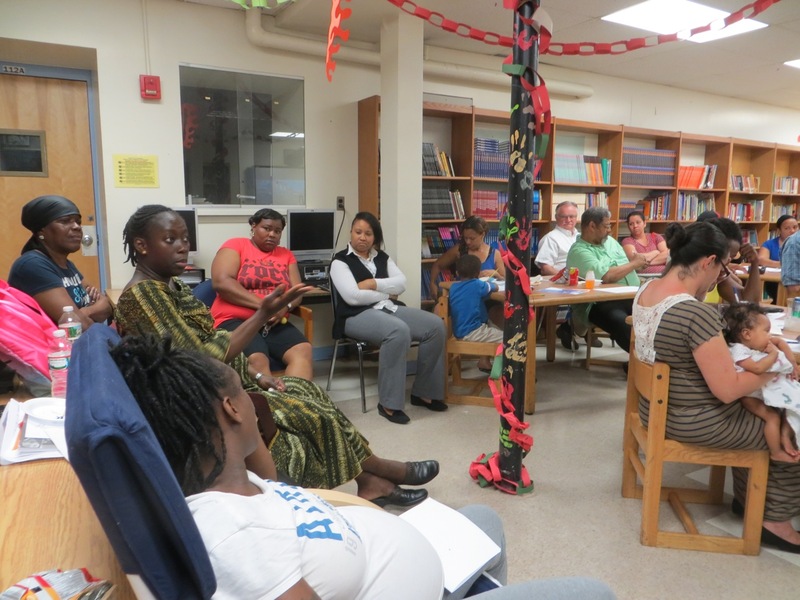 These water experts and Sussex Avenue parents asked questions and offered comments on the students’ work. 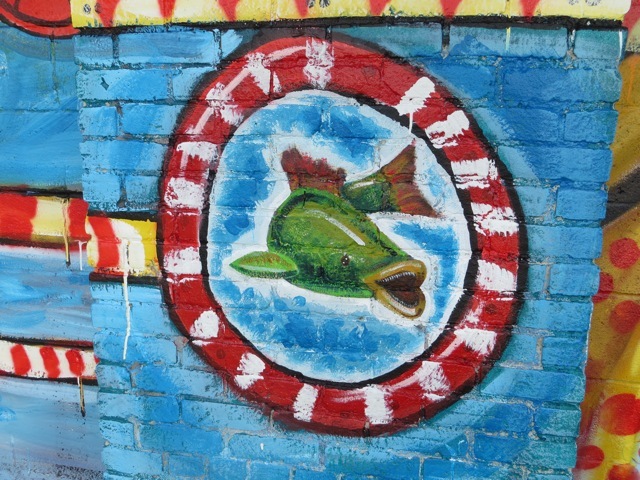 The Newark Public Art Program seeks lead and supporting artists for Newark Murals. 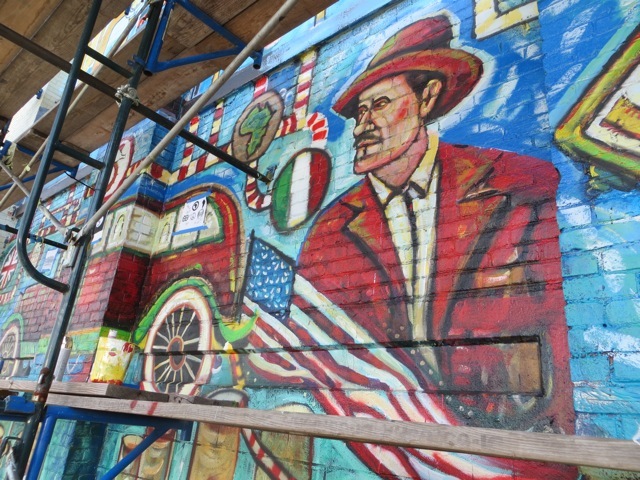 Newark Murals tell Newark’s stories, celebrating and commemorating underrecognized people, places, and events. Each Newark Mural results from a collaboration between a community-based organization, young people, researchers, and artists convened and facilitated by Newark Public Art Program staff. Projects range from 4 to 10 months in length, and artist stipends vary based on project scope and artist experience. Past murals have ranged in size from 800 to 6000 square feet. Applicants must have experience in making large-scale graphic or visual art, collaborating with students and community-based organizations, and a strong interest in engaging Newark communities. Lead and supporting artists will implement project according to work plan and schedule, contribute to a collaborative design process with diverse stakeholders and participate in formal approval process, serve as painting site manager, supervise students and/or community participants, administer evaluations and assessments, and participate in the dedication ceremony. Sites for 2014-15 projects have been selected based on nominations submitted by community-based organizations. See flyer for anticipated sites. The Newark Public Art Program is committed to create artwork in places where it will matter most to improving everyday life in Newark. 3. 5-10 JPEGs of relevant past work with accompanying two sentence descriptions about the artwork and your specific involvement in the piece (not included in page limit). 4. Names and contact information for three professional references with whom you have worked on relevant projects. On Friday, August 23, 4-7 pm, please join the Newark Public Art Program, South Ward Councilman Ras Baraka, the Clinton Hill Community & Early Childhood Center, lead artist Gladys Barker Grauer, arts administrator City Without Walls, and others to dedicate the Newark Public Art Program’s twenty-fourth large-scale outdoor painting, titled A Tribute to Newark Jazz Clubs, which overlooks David L. Warner Playground at 390 Hawthorne Avenue. 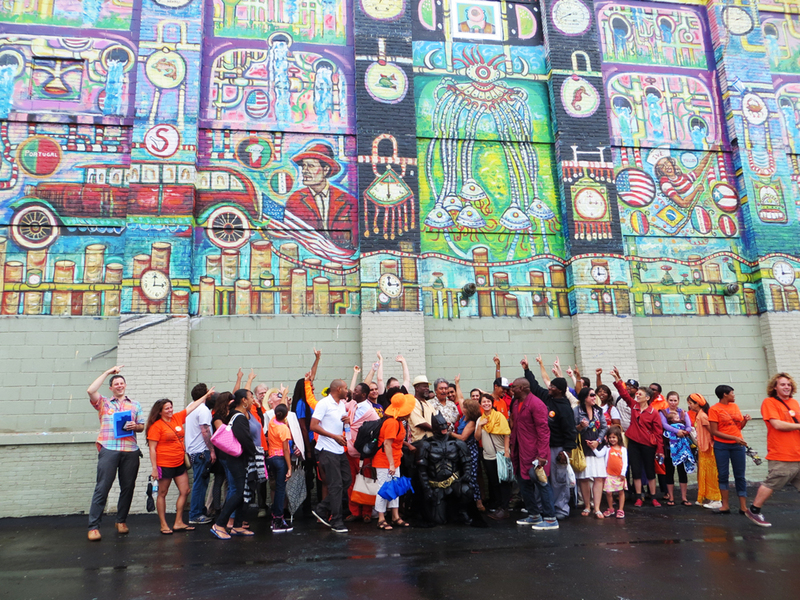 The mural is the twenty-fourth completed since Mayor Booker launched the Newark Public Art Program (NPAP) in 2009 under the direction of the Newark Planning Office. Newark Murals tell Newark’s stories, celebrating and commemorating under-recognized people, places, and events. For each mural project, NPAP leads a collaboration of a community-based organization, artists and researchers, and young people to design and produce a large-scale outdoor painting. A Tribute to Newark Jazz Clubs celebrates the city’s history as a hotspot of jazz composition and performance, featuring a lively scene of playing, dancing, and listening. The painting includes the names of 22 legendary Newark jazz clubs including Carvan, the Key Club, Sparkey J’s, and Lloyd’s Manor. It was designed and produced in collaboration by the Newark Public Art Program; community partner and wall owner the Clinton Hill Community & Early Childhood Center; lead artist Gladys Barker Grauer; supporting artist Melanie Stokes; additional artists and NewarkWORKS students Yasmine DeJesus, Malik Hardaway, Onnie Strother, Nicole Thompson, Lee Johnson, Larry Hilton, Cheryll Fowler, Kaela Berdecia; and arts administrator City Without Walls. 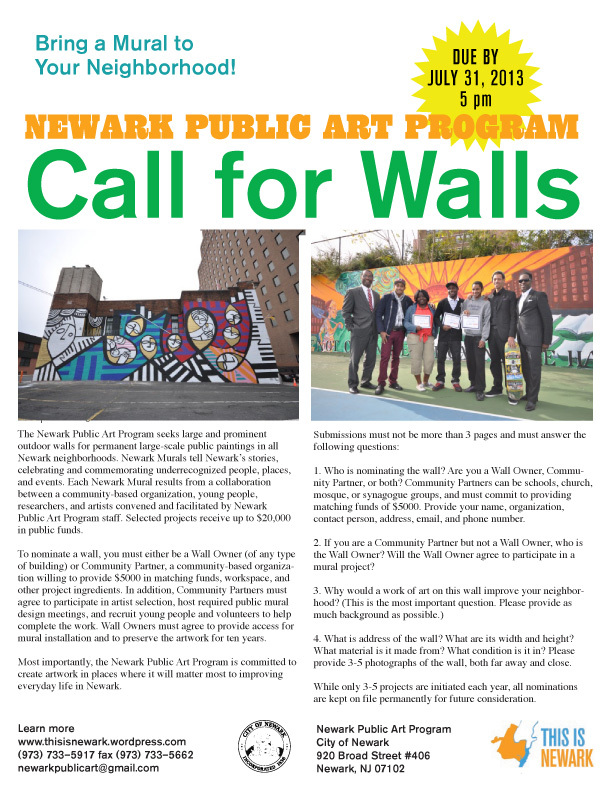 A partnership between the wall’s owner, Seidler Chemical Company, and the Ironbound Community Corporation (ICC) nominated the wall to the Newark Public Art Program‘s annual Call for Walls, explaining that the story of community organizing behind the new park deserved to be told through public art in the park itself. 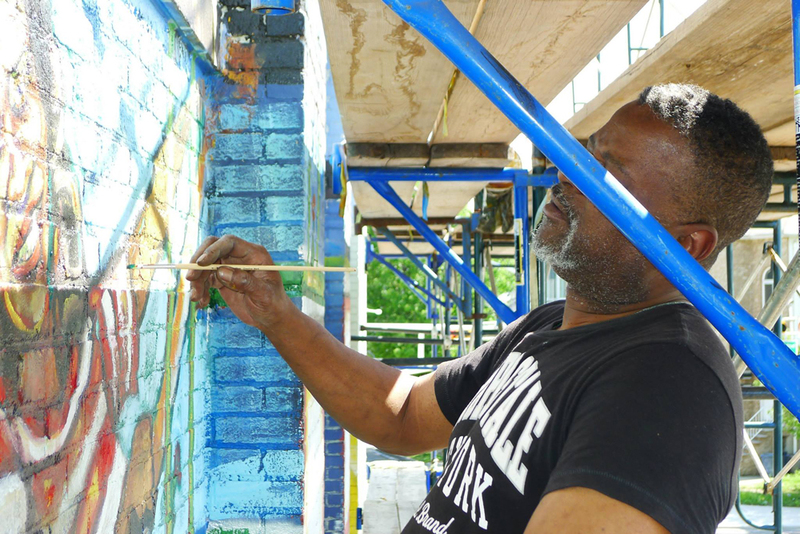 As one of six selected sites for 2012, the Newark Public Art Program convened and led a team of artists headed by Kevin Sampson to work with ICC and Ironbound residents to develop the design and produce the mural. Left: August 3 dedication with Batman. Right: A Passaic River fish. Above: Preliminary sketch by Sampson developed with NPAP & ICC. Above: Painters at work. The painting shows a fantasy steampunk version of the area’s relationship to the river, visualizing how the river, the city, and residents have mechanically grown into one another in both amazing productive and frighteningly poisonous ways. Most of all it shows how people have come together to improve this system, including creating the park that the mural overlooks. Bring a Mural to Your Neighborhood! The Newark Public Art Program seeks large and prominent outdoor walls for permanent large-scale public paintings in all Newark neighborhoods. Newark Murals tell Newark’s stories, celebrating and commemorating underrecognized people, places, and events. Each Newark Mural results from a collaboration between a community-based organization, young people, researchers, and artists convened and facilitated by Newark Public Art Program staff. Selected projects receive up to $20,000 in public funds. To nominate a wall, you must either be a Wall Owner (of any type of building) or Community Partner, a community-based organization willing to provide $5000 in matching funds, workspace, and other project ingredients. In addition, Community Partners must agree to participate in artist selection, host required public mural design meetings, and recruit young people and volunteers to help complete the work. Wall Owners must agree to provide access for mural installation and to preserve the artwork for ten years. Most importantly, the Newark Public Art Program is committed to create artwork in places where it will matter most to improving everyday life in Newark. 1. Who is nominating the wall? Are you a Wall Owner, Community Partner, or both? Community Partners can be schools, church, mosque, or synagogue groups, and must commit to providing matching funds of $5000. Provide your name, organization, contact person, address, email, and phone number. 2. If you are a Community Partner but not a Wall Owner, who is the Wall Owner? Will the Wall Owner agree to participate in a mural project? 4. What is address of the wall? What are its width and height? What material is it made from? What condition is it in? Please provide 3-5 photographs of the wall, both far away and close. While only 3-5 projects are initiated each year, all nominations are kept on file permanently for future consideration.